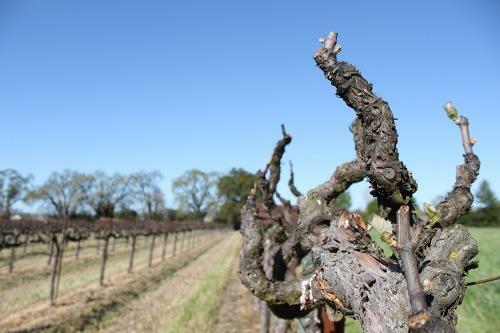 realize this vision, the Baker family has assembled an estate program that includes three distinct and coveted vineyards--Baker Ridge, Starr Ridge and Cresta Ridge. Offering a diversity of microclimates, soil types, exposures, vine age and clonal material, these exceptional hillside vineyards provide Thomas George Estates with a complex palette of fruit from which to craft its limited-production wines. These artisan wines are handmade in small lots in a style that emphasizes balance, brightness and terroir-inspired sophistication. Baker Ridge Vineyard and the Thomas George Estates winery are located just off Westside Road in the acclaimed Middle Reach region of the Russian River Valley. Both the vineyard and winery were originally owned by winemaking legend Davis Bynum, who was the first individual to establish a winery on Westside Road, and the first to bottle a wine using the Russian River Valley appellation designation. Building on this legacy, the Baker family has reinvigorated the vineyard and winery (with Davis's enthusiastic support), replanting all but the most coveted old Pinot Noir vines, and building a state-of-the-art winemaking facility within the hop kilns buildings that housed the original winery. As part of the revitalization of this beautiful and iconic property, the Bakers have added an expansive crush pad and 8,000 square feet of caves for optimal barrel storage, and winery events. They have also renovated the site's four guesthouses to underscore Thomas George Estates' commitment to providing an inspired and casual, yet elegant visitor experience. This attention to quality in every detail is most apparent in the wines themselves. Whether crafted to reflect the diversity of the Russian River Valley, or to highlight the distinct character of a single estate vineyard, or even a single block, every wine in the Thomas George Estates portfolio is made with a sense of purpose and identity. Though the winemaking approach is tailored to express the authentic character of each wine, there is a continuity of style throughout the portfolio. Utilizing both traditional and modern techniques, talented Winemaker John Wilson applies a light hand, emphasizing lower alcohols and the judicious use of new oak to create wines that favor balance over overt ripeness. As a result, the wines of Thomas George Estates display beautiful aromatics and layers of pure varietal flavor. In the vineyards, John Wilson and the Bakers work alongside famed Vineyard Manager Ulises Valdez, who guides the farming of some of the most prestigious winegrowing properties in Northern California, and has overseen Thomas George's estate program since day one. To ensure the highest standards of excellence, the vineyard team also benefits from the expertise of renowned vineyard consultant Bob Gallagher of Crop Care Associates. In total, Thomas George's Russian River Valley estate program encompasses 103.1-planted acres, with 55.99 acres and eight clones of Pinot Noir, 27.95 acres and five clones of Chardonnay, 7.14 acres of Grenache, 5.02 acres of Zinfandel, 4 acres of Viognier and 3 acres of Grenache Blan .